As we wish to acquaint our students with leaders in democracy, social justice, civil rights, or nonviolence, Cesar Chavez is a person worth focusing on. The following is a lesson sequence that can be used in middle or high school, modeled after a similar lesson I posted on Maya Angelou. It may take a few classes to complete. We are going to learn about a man of great courage who believed that the most powerful weapon in the world was non-violence and peace. His name was Cesar Chavez. I am going to read to you a little bit about his life. It's very important that you understand everything we are talking about. This is why we want you to learn to read and read well. If you can't read well, it's very hard to understand everything that is happening around you. So if you hear a word or an idea that you do not know, stop me and we will look it up. I also want you to learn how to look up what you don't know. Stop me as often as you need to. I know that there are many new words and difficult ideas ahead. Cesar Chavez was a civil rights and labor leader, an advocate for farmworkers as well as a farmworker himself, and a champion of preserving our natural environment, especially from chemicals and pesticides. Chavez believed in nonviolence as a way to create social change. He and his followers used boycotts, strikes, and fasts as their methods. Cesar Chavez was born in 1927 on a small farm near Yuma, Arizona. When he was 10 years old, his family's farm was taken over by the state because his family could not pay their bills. This led to his family traveling to various places to get jobs farming, what we now call migrant farm workers. Adults and children worked fifteen hours a day, every day, in the hot sun. They earned less than the minimum wage, sometimes a dollar an hour, sometimes less. They lived in rooms without bathrooms, with 6 to 8 people per room. Cesar Chavez was one of many Mexican Americans living as migrant farm workers. They were known as Chicanos. Cesar Chavez, like most other Chicano migrants workers, attended more than 30 different elementary and middle schools growing up. They saw many signs that said, "No dogs or Mexicans allowed" outside public places. He did not like this life and he did not like what he saw it doing to his family and others. Many people do not know that 10 years before Rosa Parks was arrested in Alabama for not giving up her seat on a bus, Cesar Chavez was arrested and put in prison in California because he sat in the section of a movie theater reserved for Japanese and white customers only, not for African Americans or Latinos. At that time, movie theaters were segregated. 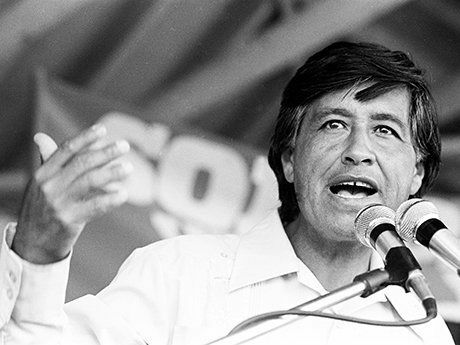 Cesar Chavez led protests against the inhumane treatment of migrant workers and eventually of all workers who were underpaid, poorly treated, and exploited by their bosses. He worked with African Americans, Puerto Ricans, Filipinos, and Chicanos most of all, but not only. He taught them non-violence and admired the methods of Martin Luther King, Jr. and Gandhi. He started an organization, the National Farm Workers Association, to serve as a union for workers and encouraged farm workers to work together and act together to be more effective. Strikes, boycotts, and marches led to many successes. He created great pride and dignity and hope in people. Cesar Chavez once said, "When the man who feeds the world by toiling in the field is himself deprived of the basic rights of feeding and caring for his own family, the whole community of man is sick." Below are parts of speeches by Cesar Chavez, one honoring the memory of Rev. Martin Luther King, Jr. after his assassination in 1968 and the other, from the end of a fast that helped reduce the use of pesticides in grape farming in 1970. Have students work in groups to read each part and look up the words, ideas, and places that they are not familiar with. You may want to start with the first paragraph of Part One for the whole group and model for them the importance of understanding everything they do not know and how to look up the information. It will be very useful to spend time ensuring they understand the idea of a "rate" of such things as cancer and other health issues, and the importance of a community knowing how well or poorly the rates are in various areas. You might want to extend this at some point into a research project on health rates in the city or area where they live, or suggest this as a follow up project in math and/or health classes. Part One: What is the problem that Cesar Chavez was so concerned about? Why was he so concerned? Part Two: What did Cesar Chavez believe was the cause of the problem? Part Three: What did Cesar Chavez suggest could help solve the problem? Why did he think it was important? Why did he want individuals to find a just cause they care about and work for it? Part Four: How did Cesar Chavez believe people could best solve their problems? What actions did he believe showed courage and strength and "manliness"? Do you agree with him? Why or why not? Why did he believe as he did? "The Central Valley of California is one of the wealthiest agricultural regions in the world. In its midst are clusters of children dying from cancer. The children live in communities surrounded by the grape fields that employ their parents. The children come into contact with the poisons when they play outside, when they drink the water, and whey they hug their parents returning from the fields. And the children are dying. They are dying slow, painful, cruel deaths in towns called cancer clusters, like McFarland, where the children's cancer rate is 800 percent above normal." "Other young children are suffering from similar fatal diseases that the experts believe are caused by pesticides. These same pesticides can be found on the grapes you buy in the stores. My friends, the suffering must end. We have no choice, we have to stop the plague of pesticides." "The growers responsible for this outrage are blinded by greed, by racism, and by power. The same inhumanity displayed at Selma, in Birmingham, in so many of Dr. King's battlegrounds, is displayed every day on the vineyards of California." "The simple act of refusing to buy table grapes laced with pesticides is a powerful statement that the growers understand. For your safety, for the workers, and for the children, we must act together. My friends, Dr. King realized that the only real wealth comes from helping others. I challenge you to carry on his work by volunteering to work for a just cause you believe in." "Our struggle is not easy, Those who oppose our cause are rich and powerful and they have many allies in high places. We are poor. Our allies are few. But we have something the rich do not own. We have our own bodies and spirits and the justice of our cause as weapons. When we are really honest with ourselves we must admit that our lives are all that really belong to us. So, it is how we use our lives that determines what kind of people we are. It is my belief that only by giving our lives do we find life. I am convinced that the truest act of courage, the strongest act of manliness is to sacrifice ourselves for others in a totally nonviolent struggle for justice." Tell the class, "Let's go back to what Cesar Chavez once said: 'When the man who feeds the world by toiling in the field is himself deprived of the basic rights of feeding and caring for his own family, the whole community of man is sick.'" What do you think he meant by that? What basic rights do you feel you should have? Should everyone in the community or in school have those same rights? Why or why not? What can you do to help others have their rights? What are your thoughts and ideas about the lesson shared in this post? Please share in the comments section below.